Osteoporosis medication Boniva. Boniva is the brand name for Ibandronate "a highly potent N-containing bisphosphonate". Like all bisphosphonates it inhibits (slows) the action of osteoclasts, the cells that remove 'old bone'. Compared with other bisphosphonates, it has a high antiresorptive potency and that means that you can use a lower dose to achieve the the same result of inhibiting the removal of 'old bone' as some of the other drugs of this class. Once monthly tablet. This once-a-month dosage overcame one of the On March 25, 2005 Osteoporosis medication Boniva was approved as a very real drawbacks to all bisphosophnate treatment - the need to take daily tablets and ensure that the drug did not erode the surface of the esophagus each time it was taken. January 6, 2006 the FDA approved an injectable form of Boniva. As a result it became the first intravenous (IV) drug approved for the treatment of postmenopausal Osteoporosis. Since this time there have been a number of other intravenous drugs approved to treat Osteoporosis. 2016. Predictors of Ibandronate Efficacy for the Management of Osteoporosis. Researchers reviews the results of 34 studies and concluded:"Longer treatment duration from 1 to 5 years, increasing age, lower baseline T scores, and higher serum CTX levels are identified as the predictors of better efficacy of ibandronate in the study subjects with osteoporosis or decreased BMD." 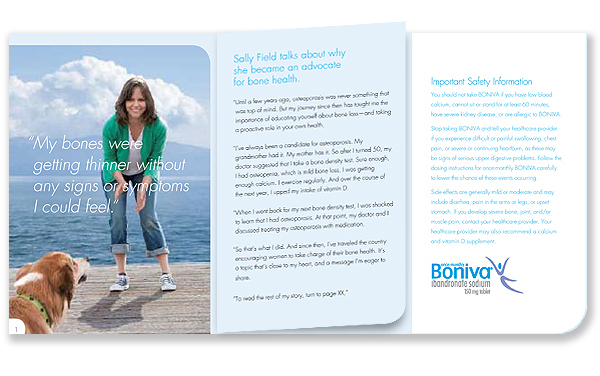 Many observers believe that one of the reasons for the popularity of Osteoporosis Medication Boniva is the fact that the some years back company hired Sally Field, a popular actress, to do a T.V. ad promoting their drug. Later the FDA warned Genetech about an ad for the injectable form of the drug in the Dec. 12 issue of Parade magazine as being misleading. What questions should I raise with my health care provider when we discuss this Osteoporosis medication Boniva? if you cannot sit or stand up for at least 1 hour (60 minutes) in the morning before eating. if you have swallowing problems or other problems with your esophagus (the tube that connects your mouth and stomach). Also, be sure to tell your health care provider the names of all the medicines you take. Include prescription and non-prescription medicines, vitamins and/or supplements since some of these could interfere with the effectiveness of this drug. These are important issues. Please do not be shy. Raise them when your health care provider first suggests this pharmaceutical drug. (For some people this may not be the best or safest choice. But unless you 'speak up' your health care provider can not make a good evaluation. Are there any warnings or side effects for Boniva as an Osteopenia medication? Boniva may cause serious problems in your esophagus or stomach such as trouble swallowing, heartburn, and ulcers. If you have chest pain, heartburn, stomach pain or trouble swallowing, stop taking Boniva immediately and call your health care provider before taking additional doses of this drug as your Osteopenia medication. Some people experience other side effects from the drug: upset stomach, diarrhea or pain in their arms or legs.